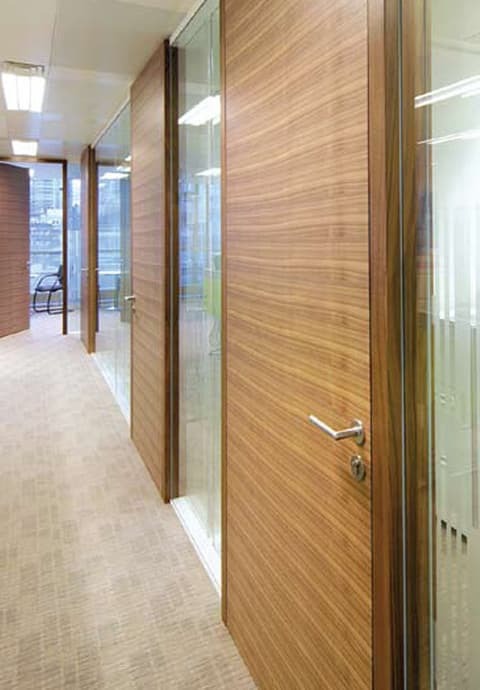 A high performance acoustic timber door offering 44 dB sound reduction. The door is ideal for apartments, hotels, boardrooms, conference rooms, offices, theatres, cinemas, radio/TV studio’s and music studios. Convenient: The JCW Acoustic Door Premier is easy to install and available for fast delivery nationwide. Choice: A choice of fully finished wood veneer, laminate or paint finish. Bespoke: Door sets are manufactured to your precise specifications. JCW Acoustic Silent Door Premier is fully tested and authenticated by a NAMAS accredited laboratory to 44 dB sound reduction.